I starting to like this size. The draw is very easy and expertly made, feels good if not light weight for its size-not densely filled like the Montecristo #2s. The flip of this is, it burns fairly quick but without issue. I've had the Edmundo too- and this is quite different in flavors - the wrapper is beautiful and feels great in hand. The Montecristo flavors are softer, and more mellow in this big stick. The immediate impression is chocolate/mocha/coffee notes on the pallet. It does build slowly in body and intensity of flavors as it burns. Very easy to retro-hale. I'd say mild to medium body-no harsh tones. Its a decent value for an Limited Edition (10 box is a nice package to sample) and I'd say smoking one now a year later is much better than when I tried the first ones (as it usually is with Cuban sticks). Not complex and powerful like the #2 - just a sweet cocoa aftertaste puff after puff. Last 3rd does pickup in strength of flavors but never sours. Perfect anytime smoke for mornings with coffee, empty stomachs, etc., and of course for dessert! I received my first batch of Montecristo Grand Edmundo 2010 Limited Edition in Sept. 2010. I smoked my first after 3 months in the humidor - amazing. After a year mellowing, these things start getting incredible. So complex with different notes and hints through the light up, middle and down to the last inch and a quarter. I smoked one after 18 months - SICK!!! Initial notes of light chocolate, coffee and vanilla - hints of spice and pepper. Middle of the cigar - darker chocolate, espresso and the vanilla gives way to caramel. Last quarter of the cigar - super intense all the flavors blending and intensifying. Let the girl I was with draw and asked what she tasted? She got a good draw and let it sit - her reply "MACHHIATO!!!!! HOW DID THEY DO THAT?!!!!" I am usually conservative in my reviews, but if there is a must have for cigar lovers, this is it!!! Complex, chocolatey mocha goodness, earthy, spicy, kept me entertained. A fine LE for once, was really surprised with this one... Will only get better with time. Awesome! This cigar is not to be missed. It is an octave higher than what you would expect. 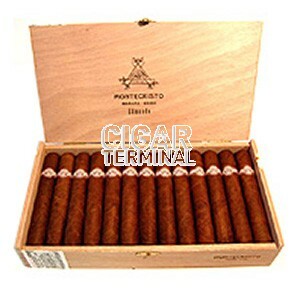 From the first time you light this, you'll taste and smell aromas that characterize the Montecristo cigar. It will take you off to your own paradise that separates you from the crowd. Buy this for the quality and taste but you need to get this for your peace of heaven.